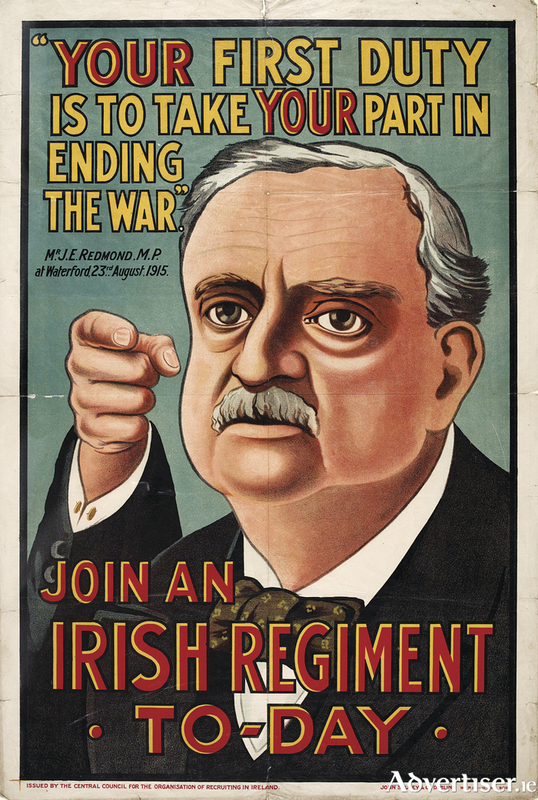 John Redmond MP urging Irishmen to join the British army. One hundred years ago there were a series of truly terrible battles on the Western Front which were watched anxiously in Ireland as elsewhere. On June 7, near the Belgian village of Messines, the Allied army won a substantial victory. It gave hope, which turned out to be tragically false, that perhaps this was the beginning of the end of the war. With the capture of the Messines ridge, the Allies were confident they could clear a path all the way down to Passchendaele, and capture the Belgian coast up the Dutch border. The Messines ridge had given the deeply dug in German army the advantage of height over a wide and sprawling battlefield. It was impossible to drive them back by conventional fontal attack. Victory was won by English and Welsh miners who had tunneled their way under the German lines, and laid a series of massive mines. They began to explode before dawn on June 7. The British army, ready to move forward immediately after, stood awestruck as it witnessed the biggest man-made explosions of the war. It is said that the British prime minister, Lloyd George, heard the the explosions in London. Thousands of enemy soldiers were immediately killed or wounded. Although many of the surviving Germans were bewildered and unable to fight, there was still serious resistance as the Allies moved across the shattered ridge. It took another seven days to bring the battle to a close. It was, however, the first battle where there was a substantial difference in the number of casualties: The Allies lost 17,000 killed or wounded; the Germans 25,000. In April 1959 Patrick Carroll wrote a 20-page letter to the eminent academic and military historian GA Hayes-McCoy, the professor of history at UCG. The letter was almost lost when his house was being cleared out, but was happily saved by the historian’s son Robert who has now made it available. Gerard Anthony Hayes-McCoy (1911-1975 ) is rightly regarded as one of the leading Irish historians of his generation, and one of a chain of distinguised scholars of history that NUIG has inspired Hayes-McCoy’s family home was located where the Galway Advertiser office is today, on the north of Eyre Square. It was a hairdressing establishment ‘for gentlemen’. He went to ‘The Bish’ and UCG, where his passion for history was set alight by the exceptional historian Mary Donovan O’Sullivan. He succeeded her, as professor, in 1958. He relished teaching undergraduates, and supervising research. He was a stickler for syntax and proper presentation of students’ work. He produced an impressive list of publications, and sought a wider readership through journalism and editing The Irish Sword. Previously he had married Mary O’Connor, but his life was complicated because Mary and his five children resided in Dublin, while he took rooms at the Great Southern Hotel, from Tuesday to Friday during term. He is described as ‘a mild mannered person of liberal catholic convictions’, but was a strident public opponent of the application of an Irish language test to all who aspired to hold any position in any faculty at UCG. **** A debate that still lingers, and excites passion today! However, the interesting Hayes-McCoy is a diversion to the main story of the rolling battles that followed in Flanders, a century ago. By the end of July 1917, and with full confidence of victory, the Allies pressed on and opened the Third Battle of Ypres (Passchendaele ). It was a total and pitiful disaster. This time the weather and mud were the real enemy. The remorseless shelling of already muddy ground, made conditions swampy and progress perilously slow. Both sides suffered appalling losses. Between July 31 and November 6 the German army suffered 260,000 casualties, while the Allies lost an incredible 310,000. Among them was the Co Meath poet Francis Ledwidge. Clarenbridge writer and broadcaster John Quinn gives us some background to Ledwidge’s thinking and poetry in his book A Little Book of Ledwidge. I will try to tell some of that story next week. NOTES: *The death of his brother was a severe blow to Redmond, whose authority had greatly diminished following the Easter Rising the previous year. He died March 6 1918, aged 61 years. The number of Irish deaths in the British army is officially recorded as 27,405. The monument at the Islandbridge memorial in Dublin reads: ‘To the memory of 49,400 who gave their lives in the Great War 1914-1918.’ No doubt the larger total reflects the numbers ‘missing’, and those Irish who fought in other Allied armies, such as the US, Canada, and Australia. **The Biggest Explosion of the Great War? by Sean Boyne, published in History Ireland, July/August 2017. ***Hayes-McCoy’s published works include: Scots Mercenary Forces in Ireland 1565-1603, (1937 ) The Irish at War (1964 ), Irish Battles: A Military history of Ireland (1969 ), and A History of Irish Flags from Earliest Times (1979 ). etc. **** Nicholas Canny, in the Dictionary of Irish Biography.